It’s easy to be cynical about a film like The 5th Wave – it’s just the latest in what seems to be dozens of YA adaptations in development that are trying to cash in on the popularity of The Hunger Games, Divergent et al, and like a lot of them it sees a young female protagonist being forced into some form of combat and survival mode as the world around them is crumbling in some manner, all the while being tempted by two polar-opposite but equally tempting love interests. But to be fair, when compared to something like The Host, this is honestly one of the few that isn’t as bad as people would presume it to be – though it certainly is dumber than a lot of them, there should be no denying. Filling the role of “young female protagonist” here is Cassie (Chloë Grace Moretz), a normal teenager whose life changes forever when Earth is suddenly invaded by a series of terrible Asylum-level visual effects – er, sorry, we mean aliens – actually no, they’re referred to as “Others” for some reason. The “Others” devastate the planet through three “waves”: the first ridding the planet of all electricity, the second wiping out major cities through giant tsunamis, and the third killing off roughly half the human race with an airborne virus. Now with news of a 4th wave, which sees the aliens inhabit human hosts – why are we getting disturbing flashbacks to Stephanie Meyer all of a sudden? – as well as an unknown 5th wave, Cassie risks life and limb to rescue her younger brother Sammy (Zackary Arthur) from a secret army base where children are being militarised to combat the aliens head-on. Pretty silly stuff, certainly, and it certainly hits on a lot of “devastated post-Apocalypse Earth” clichés that even The Walking Dead would be embarrassed to pull off by this point. Abandoned cars on the highway? Check. Military personnel claiming to do good but might not be as friendly as they seem? You betcha. Characters who go for days, weeks, even months without hot water and yet still have absolutely perfect hair, no split ends or anything? Absolutely. Needless to say, originality isn’t this film’s strongest suit, something that director J Blakeson – whose only previous film as director was the little-seen and underappreciated British thriller The Disappearance of Alice Creed – doesn’t really attempt to fix or spice up. Then you have what seems to be a fixed point in nearly every YA story, the love-triangle that exists only because it was popular when Twilight did it. Moretz is already playing a not-very-interesting character, but when you place her in scenes where she’s ogling Alex Roe’s “complicated” male companion as he’s bathing shirtless in a nearby lake, she suddenly comes across as Bella-lite, and that’s never a good thing, especially when they’re also trying to depict this character as someone who should be more focused on other more important things. Thankfully, there’s only one scene in the whole film where the love triangle element really comes into play, but it’s dealt with quickly and is even rushed due to other events surrounding it (though it does stop the momentum dead). Incidentally, a later revelation about this particular fellow is a frankly ludicrous twist that, along with a few other discoveries, undermines the supposedly-threatening aliens “Others” and diminishes their overall effect to Signs levels of stupidity. We would ride this off as another attempt to just be The Hunger Games and fail, if it weren’t for the scenes at the military base, where Sammy is part of a militarised group of young people forced into combat. These scenes, mostly led by Jurassic World’s Nick Robinson and also featuring It Follows breakout star Maika Monroe and The Grand Budapest Hotel’s Tony Revolori, are what make the film stronger than it should be; you really feel a connection with these characters, even if they’re minor, and what they’re getting themselves into is more entertaining despite the overall stupidity of it because of their natural chemistry with each other. They end up being the ones you actually care about in the entire thing, because their characters are just more interesting. That leads to the film’s overall problem with tone; it’s as if Beasts of No Nation was suddenly interrupted by The Host. One minute, it goes from a rather intense scene of these young soldiers in combat, to a scene where Moretz is being wooed by Roe’s attractiveness. It doesn’t know whether it wants to be more along the lines of Ender’s Game or your basic Stephanie Meyer narrative, and that can be rather frustrating especially when there is a decent movie being played at the same time as a bad one. 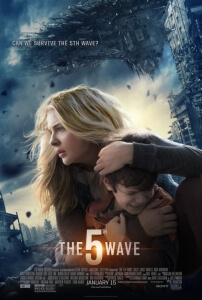 Is The 5th Wave among the worst of these YA adaptations? No, but given the elements it actually pulls off fairly well, it’s a shame that this isn’t as consistently decent as it could have been. The 5th Wave relies way too heavily on the clichés of past YA adaptations and its own dumb plot twists to fully function, which is a shame since the scenes with militarised young people – among them Maika Monroe’s awesome presence; you’d better not screw her over, Independence Day: Resurgence – do genuinely work.